The UI College of Public Health offers a number of in-house global courses, programs, and partnerships. Some of the options listed below are for graduate students only, while others include upper-level undergraduate and graduate students. For information on how to study abroad as a public health undergraduate, please click here. Students interested in any of the programs listed below should make an appointment to meet with the Global Public Health Coordinator as soon as possible. The UI College of Public Health has a standing agreement with Child Family Health International (CFHI) that allows public health students to participate in a number of global internships around the world. CFHI provides community-based Global Health Education Programs for students and institutions. Their unique model fosters reciprocal partnerships and empowerment in local communities, transforming perspectives about self, healing and global citizenship. Student can choose from internships in 10 different countries around the world, focusing on a wide variety of public health issues, including community engagement, healthcare access, reproductive health, and disease prevention. CFHI experiences are available for graduate students only. The UI College of Public Health has a long-standing relationship with Babes-Bolyai University (UBB). Located in the Apuseni Mountains of Transylvania, UBB is home to the Cluj School of Public Health. Over the course of this partnership, students and faculty alike have participated in research collaborations, student internships, professional trainings, and more. UBB provides a safe and professional environment for students to learn about public health work in a global context. Anyone interested in learning more about possible opportunities should contact the Global Public Health Coordinator. Undergraduate students may be eligible for a semester abroad. CPH enjoys a close research relationship with Deakin University’s National Centre for Farmer Health in Hamilton, Australia. Other opportunities may be available with other centers and departments at Deakin University on a case-by-case basis. Within the larger scope of their health sciences division, Deakin offers expertise in all areas of public health including environmental health, health promotion, food and nutrition science, health economics, family health, and more. The Injury and Violence Prevention Training Course offers a professional introduction and training in injury and violence prevention methodology and practical application from a global perspective. This week-long course will utilize panels, presentations, workshops and visits with local government agencies for a global, hands-on experience. This course is workshop-based and will be held in Cluj-Napoca, Romania, in partnership with the Cluj School of Public Health. This experience is open to undergraduate (junior standing or above), graduate, and doctoral students. This program is only available every 2 years and will not be available for the summer 2019 term. The MHIRT Research Internship program offers undergraduate and graduate students an opportunity to participate in a hands-on research internship in an international setting. Gain valuable skills and enhance your academic portfolio working alongside public health and health science professionals from Romania or Armenia. This internship takes place during the summer term and lasts for 10 weeks. This unique opportunity covers all expenses on behalf of the student, as well as providing a small stipend for living expenses. This experience is open to undergraduate (junior standing or above), graduate, and doctoral students who meet the NIH eligibility requirements. This fellowship offers students a once-in-a-lifetime opportunity to embed themselves in an ongoing global health topic of their choice. The selected student will spend the summer in the location of their choice, meeting with key personnel and working with a world-renowned journalist mentor to report on their topic in professional media publications. Students will be learn how to communicate public health topics in way that is informative for a wider audience – a key skill in public health implementation and success. Past students have reported on a variety of issues, such as environmental topics, women and children’s issues, resource struggles, or other public health topics. Tangaza University College (TUC) is located in Nairobi, Kenya. Within their School of Arts and Social Sciences, they offer many public health-based opportunities, primarily focused around the influences of culture, society, and religion on health. TUC also shares a close relationship with Gynocare Women’s & Fistula Hospital in Eldoret, Kenya, offering a diverse number of public health opportunities. Through TUC, students may also connect with researchers working on maternal and child health, rural health, health outcomes, and health disparities. To learn more about working with TUC, please contact the Global Public Health Coordinator. This service-learning based course offers students the opportunity to enrich their understanding of Mexican culture and history and hone their teamwork, leadership, intercultural competence, and project management skills while developing and carrying out discipline-specific projects that address community-identified needs. Taught in an interdisciplinary setting, this course takes place every spring semester and includes a week-long service trip to Xicotepec, Mexico over spring break. The service project focus will vary each year based on faculty expertise and local community needs. The University of Iowa Office of Study Abroad offers hundreds of international opportunities for students to explore and take part in. These opportunities are primarily geared toward undergraduate students of any major. 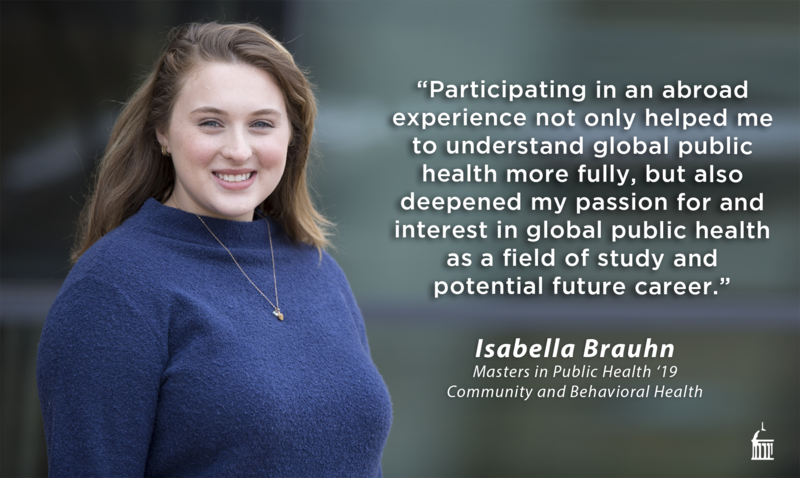 (Graduate students in the College of Public Health should meet with the Global Public Health Coordinator to learn more about global experiences available at the graduate level.) Undergraduate students majoring in Public Health can learn more about study abroad programs specific to public health by clicking the button below. Questions or comments? Contact Switzer, Sophie M. This page was last reviewed on April 8, 2019.